Recently, Microsoft announced a significant update: “We’re retiring 3DES (Triple Data Encryption Standard) in Office 365”. 3DES cipher is mostly used for TLS/SSL to encrypt HTTPS and SSH traffic. Since 2016, it has been marked as vulnerable due to SWEET32 attack (Attackers recovered small portions of plaintext when encrypted with 3DES) and planned complete usage deprecation before 2023. To provide security to data, Microsoft made changes in TLS service. Before moving into how to plan for 3DES removal, let’s see about TLS and how 3DES removal impacts TLS. Why Office 365 moving to TLS 1.2? Microsoft is planning to move all of its online services to TLS 1.2 or a later version to provide best-in-class encryption to its customers. As of February 28, 2019, Microsoft will begin retiring 3DES. As a result, if your connections are currently using a 3DES cipher suite, they will fail when 3DES cipher suites are disabled. TLS versions 1.0 and 1.1 include cipher suites based on the 3DES algorithm. So, all client-server and browser-server combinations must use TLS 1.2 or 1.2+ to maintain a connection to Office 365 services. Office 365 stopped support for TLS 1.0 and 1.1. Hence Microsoft will not fix new issues that are found when connecting Office 365 by using TLS 1.0/1.1. To ensure uninterrupted access to the Office 365 services, you need to update TLS to 1.2 or later version. How many users I have to migrate? To download TLS deprecation report directly, you can use this Microsoft’s quick link: https://servicetrust.microsoft.com/AdminPage/TlsDeprecationReport/Download. Alternatively, to download the TLS deprecation report through Microsoft secure score portal, follow the below steps. Step1: Login to Microsoft’s secure score: https://securescore.office.com and click on “Score Analyzer”. Step2: Scroll down to ‘All Actions’ . Search for “Remove TLS 1.0/1.1 and 3DES Dependencies” in Completed actions/Incomplete Actions. If you scored 5/5, You have already moved to TLS 1.2. Else, you need to plan for a migration. Step3: Click on the ‘Learn more’ button to get details on who is connecting using TLS 1.0/1.1 or 3DES. It will launch a flyout where you can click on ‘Launch now’. Step5: If you have users or devices listed under TLS1.0/1.1, start planning for an upgrade. If you are reading this blog because you are planning to migrate TLS 1.2, chances are you already read and executed the Microsoft guidance to make your connection guarded. If so, please share your experience/difficulties during TLS 1.2 migration in the comment section to assist other admins. Office 365 will not retire TLS 1.0/1.1 on February 28,2019, even though the report contains data about TLS 1.0/1.1 and 3DES connection. Issue will occur when you try to connect O365 services using 3DES from this date onwards. TLS 1.0/1.1 connection without the 3DES will not be affected but Office 365 stopped support for TLS 1.0/1.1. 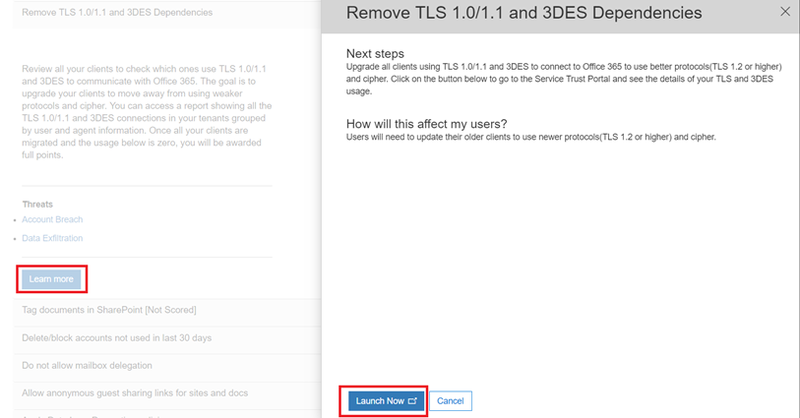 If you use TLS 1.2 in Office 365, this doesn’t mean that you must disable TLS 1.0 and 1.1 in your environment. If parts of your environment require TLS 1.0/1.1, you can leave the older protocol versions enabled.